Multimedia headquarters. 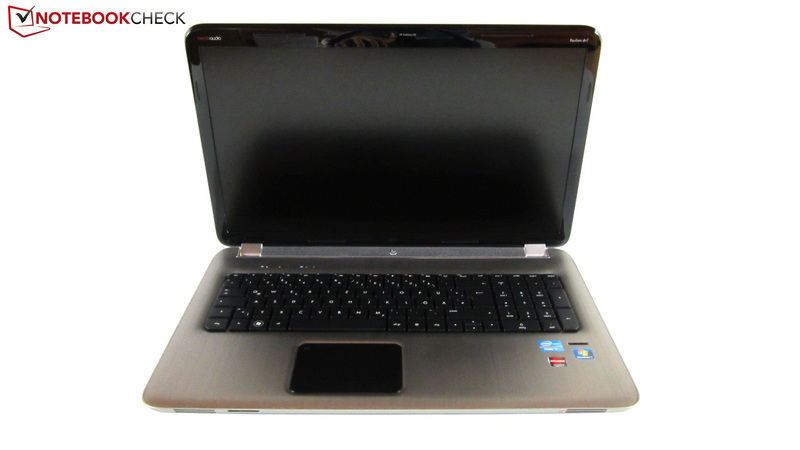 The Pavilion dv7-6b02eg has everything that can be expected from a well-equipped multimedia notebook. In addition to a quad core processor and a top of the range, DirectX 11 graphics card, a solid state drive and a BluRay burner are under the hood. Another highlight is the matt Full HD screen. Is the price of €1300 justified? 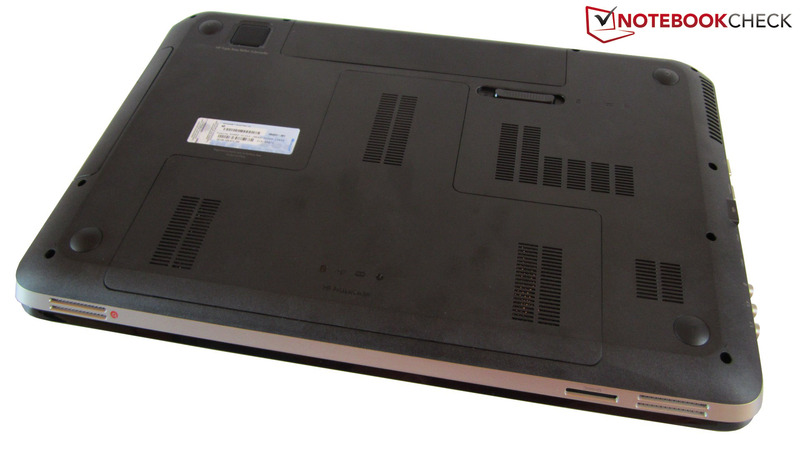 After taking a closer look at the attractively priced Pavilion dv7-6101eg (~€800) a while ago, the dv7-6b02eg for just under €1300 has to show its capabilities. Not only a quad core Sandy Bridge processor (Core i7-2670QM) is on Intel's latest HM 65 mainboard, but also an upper midrange graphics card, the Radeon HD 6770M. HP gives the dv7-6b02eg two mass memory units right away so that the preinstalled Windows 7 Home Premium 64bit can really get into gear: A 160 GB SSD and a 500 GB HDD. The manufacturer has also thought of movie fans: The non-glare, Full HD screen (1920x1080) is complemented by a BluRay drive. 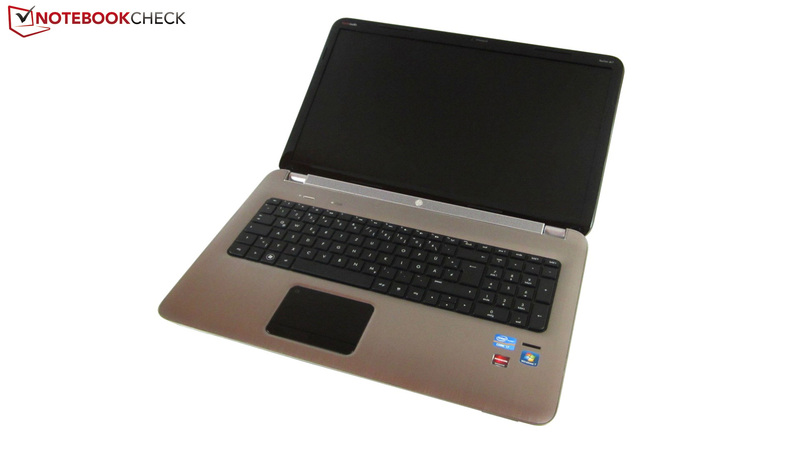 Alike an increasing number of devices, the notebook can also boast with graphics switching that reduces the power consumption automatically. The Pavilion dv7-6b02eg is also a good looker. 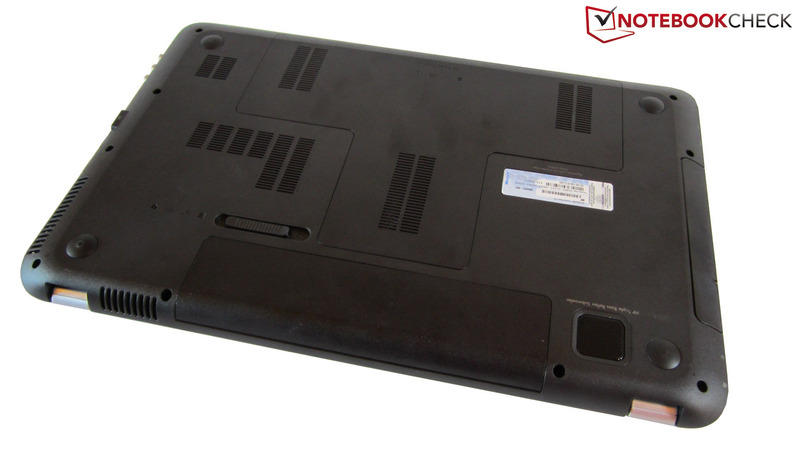 The 17 inch case isn't a lightweight with around 3.2 kilograms, but it can score with elegant metal surfaces. 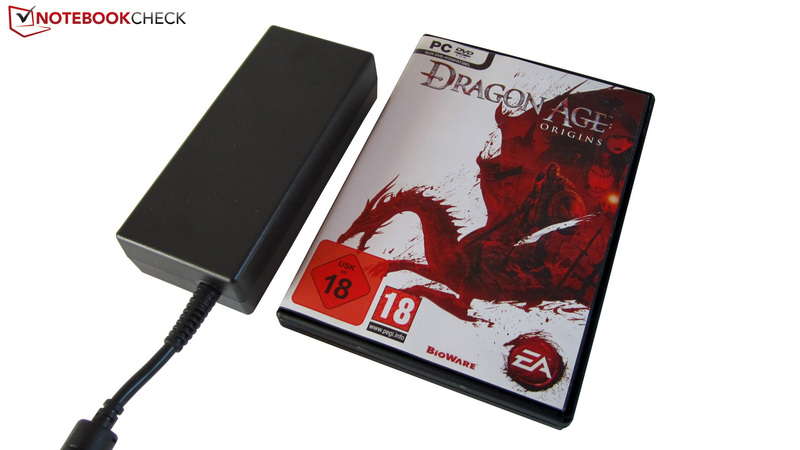 For more information about the case, input devices and connectivity, we would refer to our review of the dv7-6101eg. We will start with the screen right away. 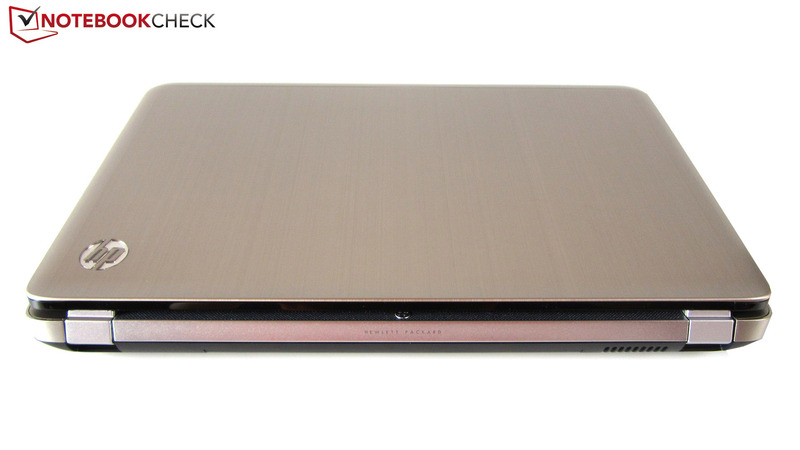 Our test device is equipped with an LED backlit screen from LG (LP173WF1-TLB5). 1920x1080 pixels are perfect for a 17 inch device and supply enough desktop surface. Two adjacently opened windows aren't a problem. For example, it's possible to do Internet research and write a text document at the same time. The 16:9 aspect ratio is great for movies. But that doesn't mean that it is an inferior screen. 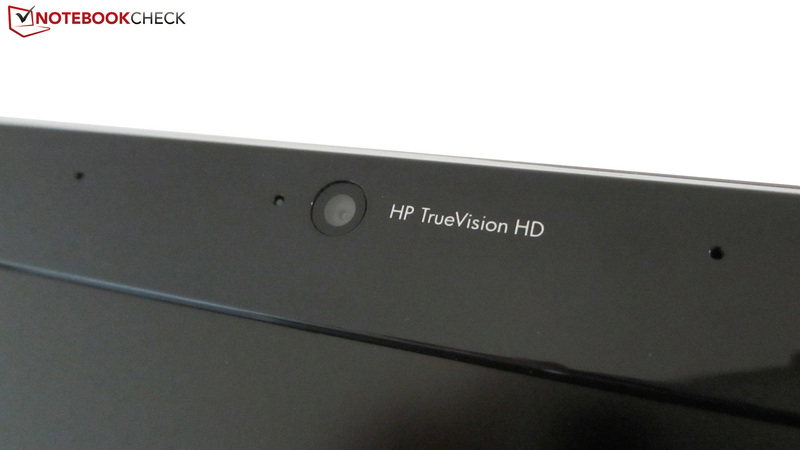 In contrast to the HD+ screen (1600x900) in the dv7-6101eg, the dv7-6b02eg's FHD screen bids a good picture quality. Its biggest unique feature is likely its great luminosity. While most contenders settle to around 200 cd/m2, the LG screen almost excels the 300 cd/m2 mark. The brightness level should be reduced because the screen is almost too bright for indoor use. But not only the luminosity earns praise, the black value does too. Dark video and gaming sequences look very gray in many devices. This has a negative impact on the media's atmosphere. Not so in the Pavilion dv7-6b02eg: 0.43 cd/m2 ensures a fairly saturated black. The maximum contrast of 707:1 is also impressive (many notebooks don't reach 200:1). The colors are surprisingly vivid for a matt screen. 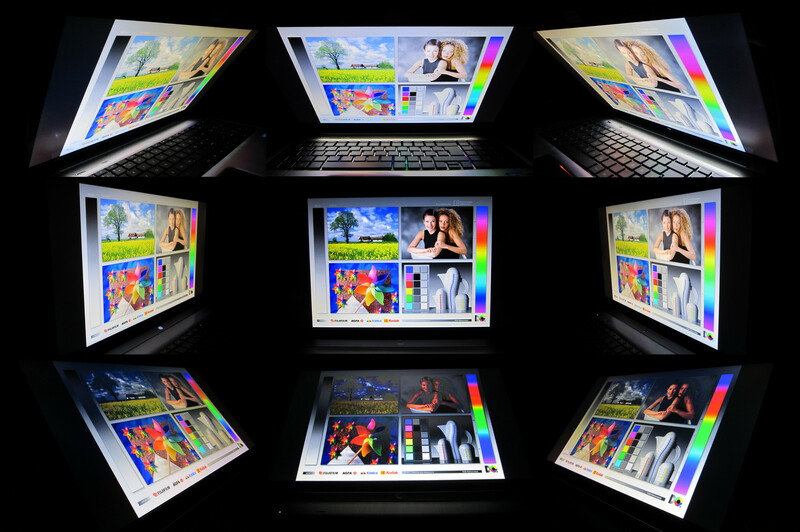 Users who occasionally edit pictures will be delighted about the almost full coverage of the sRGB color spectrum (professional users need a screen with a larger color space, though). The dv7-6b02eg gives an excellent performance outdoors. The matt surface and the high luminosity make outdoor use extremely comfortable. The contents on the screen are always well legible, no matter if in the shade or basking in the sun. Users who like to work outdoors in the summer will find it to be the perfect (though not ultra mobile) partner. There's no comparing with the extreme reflections of a typical glare screen. 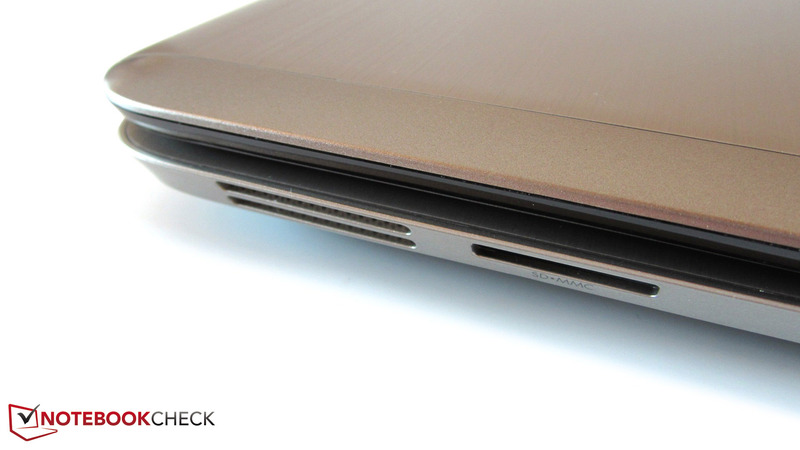 Other notebook manufacturers could take an example on the viewing angle stability (did someone say Acer?). The Pavilion dv7-6b02eg is perfectly suitable for use as a TV or gaming platform for several people because of the wide horizontal viewing angles. The viewing angles are also appealing vertically. However, views from the lower sides should be avoided as usual. 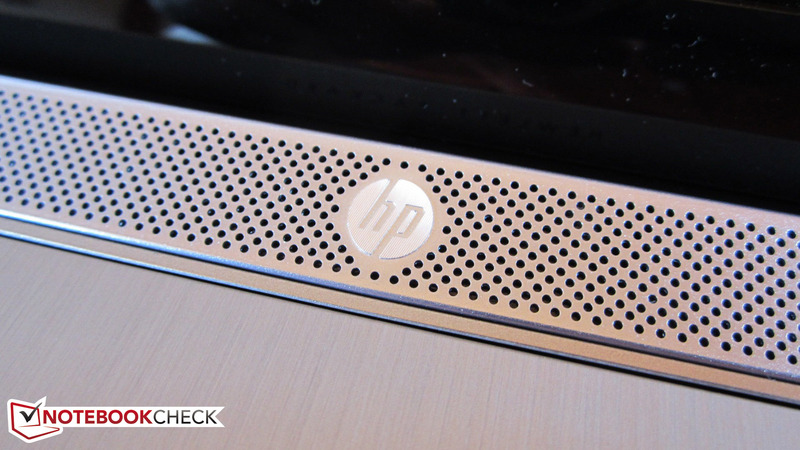 HP relies on a Sandy Bridge processor model from Intel. The Core i7-2670QM built into the dv7-6b02eg is Intel's latest quad core CPU and can process up to eight threads thanks to Hyper Threading (this technology simulates virtual cores). While the dual core i5 models have to be satisfied with 624 million transistors and an three MB L3 cache, the Core i7-2670QM has lush 995 million transistors (+60%) and a six MB L3 cache (+100%). Beyond that, Intel's well-known Turbo Boost technology, which increases the standard clock by a few 100 MHz (in this case, from 2.2 to a maximum of 3.1 GHz) is available. Another highlight is the HD Graphics 3000. It is a small graphics chip that isn't really capable of much, but consumes very little power. Alike all Sandy Bridge CPUs, the quad core is manufactured in a 32 nm process. Most buyers will be happy with the available power. 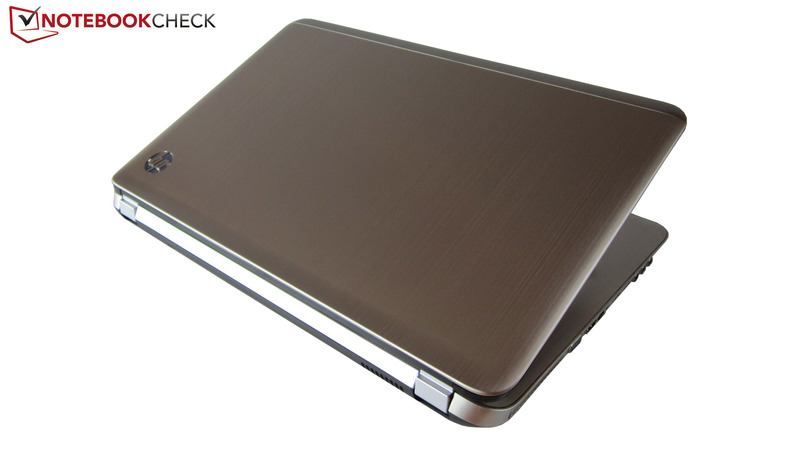 The performance of the Core i7-2670QM is beyond any doubt due to the fairly high clock and the intelligent features. The CPU can develop its full potential particularly when all cores are loaded. This fact is not least noticed in Cinebench R10's multi core rendering: With 18345 points, the Core i7-2670QM surpasses the dual Core i5-2410M clocked with 2.3-2.9 GHz by 90%, which "only" achieved 9660 points in the Pavilion dv7-6101eg. The difference is a lot lower in applications that only load one core. The advantage drops to 7% in single core rendering (4848 vs. 4551 points). Nevertheless: A quad core is significantly more future proof. It's primarily the graphics card that is the limiting factor. As mentioned earlier, HP has opted for an upper midrange graphics card. 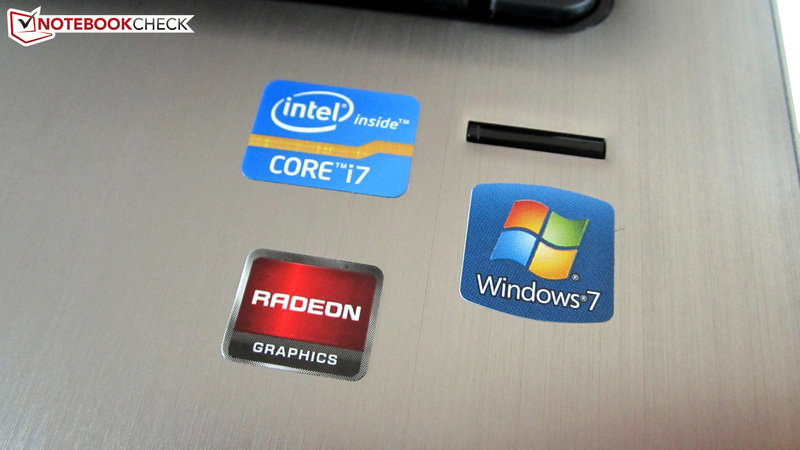 Hardly any notebook manufacturer uses AMD's Radeon HD 6770M despite its good performance. Compared with the current top model, the Radeon HD 6990M, it's principally the shader count (480 rather than 1120 stream processors) and the transistor count (716 rather than 1700 million) that is lower. Meanwhile, the clock rates are on about the same level with 725/800 MHz (HD 6770M), respectively 715/900 MHz (HD 6990M). The video memory has a generous capacity of 2048 MB; an interface of 128 bit is acceptable for a GDDR5 VRAM. A HD video decoder and a HD audio controller (surround sound via HDMI) belong to the most important features. 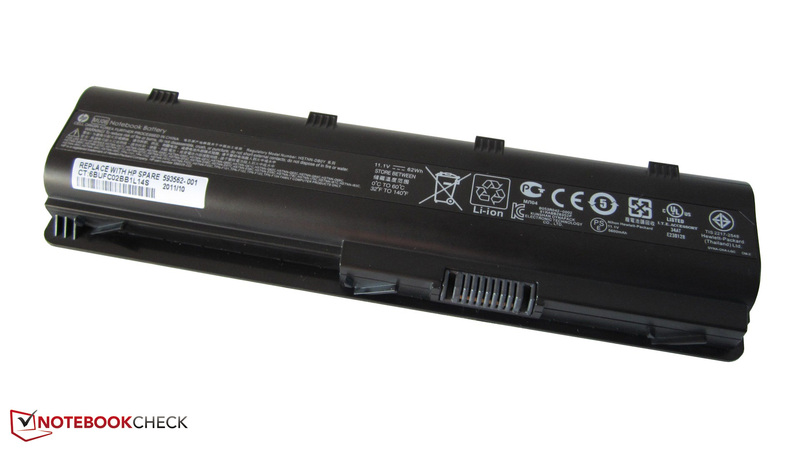 To increase the battery life and reduce the power consumption, HP treats the multimedia laptop to a dynamic graphics switching. While only Intel's HD Graphics 3000 is active during undemanding tasks, such as Office or Internet, the HD 6770M takes over in 3D applications. In contrast to Nvidia's Optimus technology, the AMD alternative still lacks reliability and convenient functions (see review). We had the problem that a black bar developed at the screen's right edge in some games with 1366x768 pixels (could also be due to the driver version theoretically). The Pavilion dv7's graphics performance excels the majority of multimedia devices. The most serious opponent for the Radeon HD 6770M is Nvidia's GeForce GT 555M. The latter is available in several versions and also comes from the upper midrange. Sometimes the one and then the other graphics card has the lead, depending on the program. Two examples: With 16.1 to 18.7 fps (Asus N75SF), the Radeon HD 6770M places itself about 14% behind the GeForce GT 555M in the Unigine Heaven benchmark (1280x1024, high, default tessellation). In return, 3DMark 11 (1280x720, performance preset, GPU score) favors the AMD graphics card, whereas the difference is relatively low with 1289 to 1258 points. We'll take a closer look at whether or not the Radeon HD 6770M is suitable for current games a bit later. HP wants to justify the fairly high laptop price with a very promising mass memory duo. We'll start with the 500 GB HDD. Our test device has a model from Samsung, the HM500JJ (2.5 inch, 9.5 millimeter height). The fast speed (7200 rpm) is noticed negatively in system noise, but supplies a good performance in return. Only few HDDs can beat a transmission rate of about 100 MB/s (CrystalDiskMark) and an access rate of 14.9 ms (HDTune). However, the real star is the integrated solid state drive. HP has likely taken a somewhat older model for price reasons. The SSDSA2BW160G3H belongs to Intel's 320 series (SATA II) and, like the name indicates, has a capacity of 160 GB. Thus, there is enough space for programs and games in addition to the operating system. Conventional HDDs don't even come close to a sequential read rate of nearly 260 MB/s and a sequential write rate of almost 170 MB/s (CrystalDiskMark). However, Intel has a hard time competing against the newer SATA III SSDs. The current performance whopper, the Samsung P830 SSD, transmits data with up to 500 MB/s. An access rate of about 0.14 ms (AS SSD benchmark) is top rate, though. The array of a solid state drive, quad core CPU and DirectX 11 GPU made an excellent impression in the system benchmarks. 16161 points in PCMark Vantage earns respect. 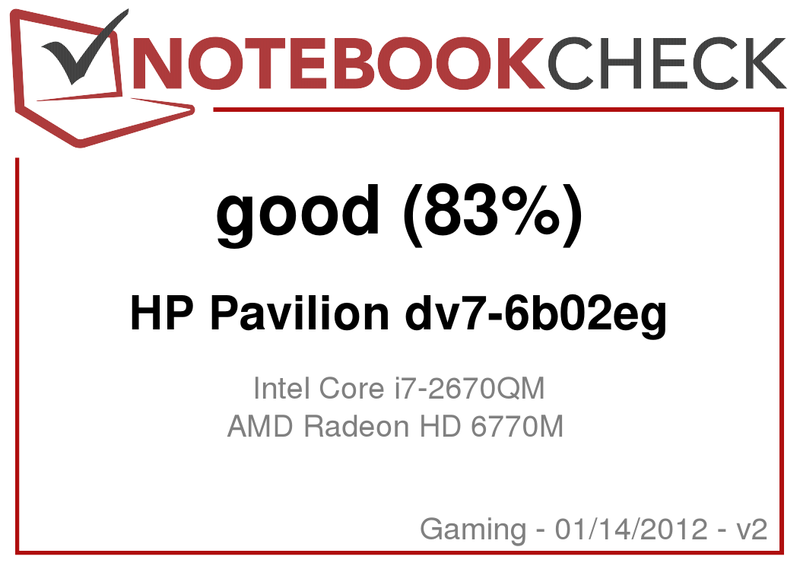 Average multimedia notebooks only achieve - if at all - half of this good score. 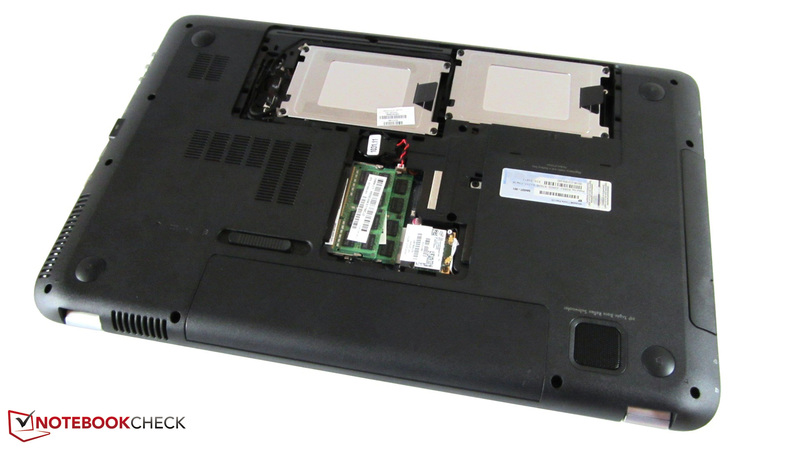 Even strong gaming notebooks don't surpass 10000 points without an SSD. This good trend is continued in PCMark 7 with 4087 points. The less expensive Pavilion dv7-6101eg only managed 2153 points here. In short: Such a well-balanced blend of hardware isn't seen every day. In addition to various application benchmarks, we also installed a few of the latest games. When antialiasing isn't used, The Old Republic is playable with 1920x1080 pixels and high details. Our benchmark sequence (a cab ride on Hutta) displayed an average of 30 fps - a good result. In comparison: The slightly older midrange GPU, Radeon HD 5650, computes about a third slower (19 fps @ Acer TravelMate 7740G). The building strategy hit, Anno 2070, can't be enjoyed with maximum graphics options. The Intro of the first campaign mission stutters intensely when 1920x1080 pixels and the preset "Very High" are used - the Pavilion dv7 only manages 14 fps. The Radeon 6770M shouldn't be faced with more than high details and 1366x768 pixels in any case (26 fps). The popular GeForce GT 540M would only manage medium details with a HD resolution. It looks similar in the newest "The Elder Scrolls" scion. While the preset "Ultra" doesn't run smoothly in the native resolution (15 fps), a mix of high details and 1366x768 pixels is quite smooth (30 fps). The immediate opponent from Nvidia, the GeForce GT 555M, is a bit slower in these settings (25 fps @ Acer Aspire 5951G). Gamers who want to play Skyrim with all controls set to full will have to look for a gaming laptop that has a high-end graphics card (e. g. the Samsung 700G7A). The multiplayer hit from the Swedish developer, DICE, teaches almost every notebook the meaning of fear. HP's multimedia machine is no exception here. High or even maximum details are too much for the Radeon HD 6770M in demanding scenes. Our benchmark (beginning of the single player mission "Operation Swordbreaker") partly stuttered considerably. We would recommend using 1366x768 pixels and medium details. The AMD graphics card lags a bit behind the GeForce GT 555M (32 fps @ Asus N75SF) with 27 fps. Note: Battlefield 3 only worked properly in the windowed mode (GPU driver: 8.830.6.3000). Batman: Arkham City also proves that the Radeon HD 6770M quickly finds its limits in DirectX 11 games. Even when "only" 1366x768 pixels, high details and two-time MSAA is selected, the action track is unplayable with 18 fps. On the other hand, medium details are rendered as smooth as silk in DirectX 9 mode (58 fps @ 1366x768). The gamer is faced with a contrasting picture in Fifa 12. Owing to moderate hardware requirements, the soccer simulation runs smoothly even on high details and four-time antialiasing in the native resolution (54 fps). It's pretty irrelevant here that Fifa 12 is actually Nvidia's territory: Depending on the setting, the GeForce GT 555M calculates almost twice as fast (almost 100 fps in maximum details). We tested F1 2011 for the race game community. 1920x1080 pixels, four-time antialiasing and the preset "Ultra" (DX 11) was regrettably too much of a good thing: The Pavilion dv7 only managed 17 fps in the built-in benchmark. On the other hand, nothing's in the way of an enjoyable race (36 fps) with 1366x768 pixels, two-time antialiasing and the preset "High" (DX 11). Again, compared with the GeForce GT 555M, Nvidia's rival GPU has the lead by about 50% with 53 fps (Asus N75SF). Finally, we'd like to present the results from the successful action / role game mix, Deus Ex 3. It's not very surprising that the AMD graphics card has serious problems with high details, 1920x1080 pixels, MLAA and 16x AF. The beginning of the games was only rendered with 19 fps. Users who would like to enjoy DirectX 11 effects should select 1366x768 pixels and medium details in the options. The Radeon HD 6770M settles to 42 fps, so about 20% behind the GeForce GT 555M (51 fps @ Asus N75SF). Strictly speaking, 1920x1080 pixels aren't really in line with the Radeon HD 6770M. Maximum graphics options remain out of bounds for newer tracks. Medium details are the utmost possible depending on the game. Although the AMD graphics card deals a lot better with 1366x768 pixels (1600x900 pixels weren't available), the image looks fairly muddy. Thus, the Pavilion dv7-6b02eg is sooner aimed at casual gamers willing to accept compromises than at avid gamers. However, the Radeon HD 6770M is in no way inferior to the GeForce GT 555M despite a few outliers (see Fifa 12) - both graphics cards are on a par. More gaming benchmarks for the Radeon HD 6770M can be found in the review of the Pavilion dv7-6101eg. 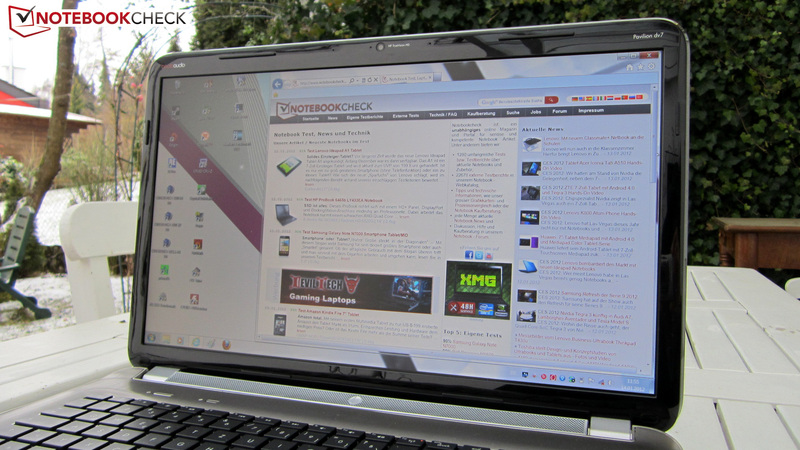 The multimedia laptop has to accept some criticism in system noise. 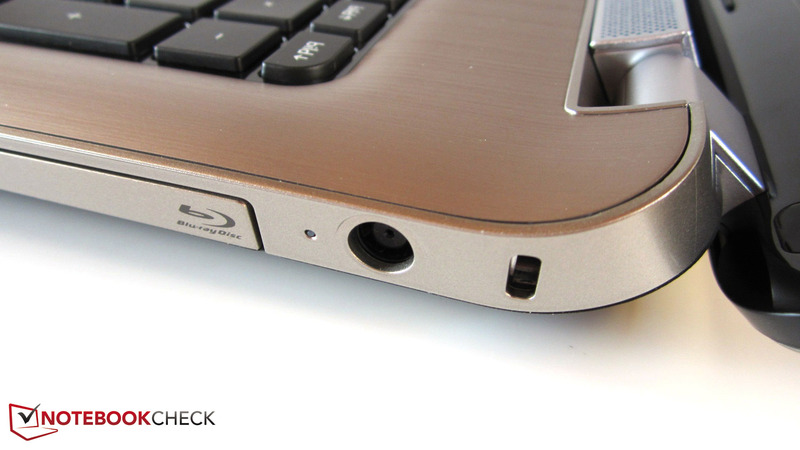 Although the fan is occasionally disabled in idle, the Pavilion dv7 is always audible. The reason: The hard disk is always noticed by a constant (but in no way annoying) noise. Unfortunately, the fan is activated occasionally in idle and ends up in a clearly audible level. Intermediate speed levels are definitely missing here. The dv7-6b02eg isn't exactly quiet during load. 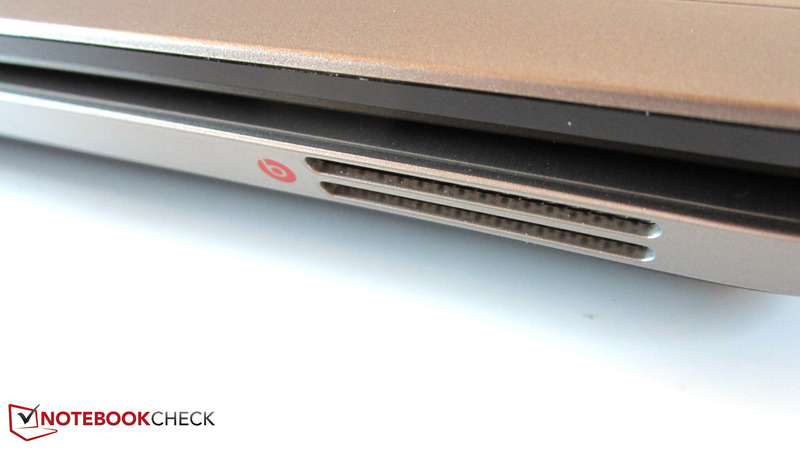 The fan's speed increases to an almost disturbingly loud level when the laptop is faced with a demanding 3D program over a longer time. While sound intensive games, such as Battlefield 3, can still be consumed properly, the fan proves to be extremely present in quieter games, such as Anno 2070. 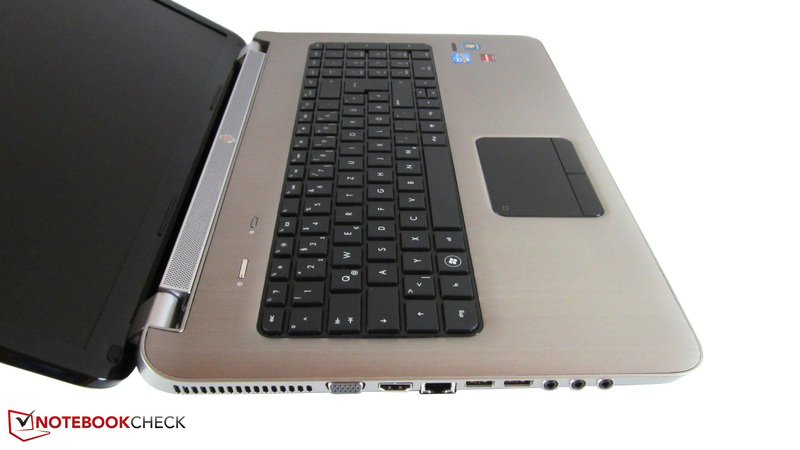 Sensitive users should sooner take a model with a dual core CPU; the Pavilion dv7-6101eg wasn't as loud in the test. We found the case temperatures in idle pleasant. An average of 21°C on the top and 25°C on the bottom is fairly low. It's possible to work with the device even for several hours when the hard disk isn't excessively accessed. We noticed that the wrist rest got a bit warmer during higher load. However, 30°C on the top is still acceptable in our opinion. The bottom heats up a lot more in the rear area. Our thermometer recorded up to 55°C in the stress test. Thus, playing a game on the lap shouldn't be risked. (+) The average temperature for the upper side under maximal load is 28.6 °C / 83 F, compared to the average of 32.9 °C / 91 F for the devices in the class Gaming. (+) The maximum temperature on the upper side is 35.7 °C / 96 F, compared to the average of 39.3 °C / 103 F, ranging from 21.6 to 68.8 °C for the class Gaming. (+) In idle usage, the average temperature for the upper side is 21.4 °C / 71 F, compared to the device average of 32.9 °C / 91 F.
(+) The average temperature of the palmrest area of similar devices was 28.7 °C / 83.7 F (+3.1 °C / 5.6 F). Turbo works perfectly as long as the Core i7-2670QM isn't over-exerted. As can be seen in the following pictures, the quad core clocks with an average of 3.0 GHz in single core load and about 2.8 GHz in multi core load. The Core i7-2670QM doesn't feel as comfortable in the stress test (full load induced by Prime and the Unigine Heaven benchmark). The high-end processor repeatedly throttles to 1400 MHz (picture 4) after a certain period of warming up (picture 3). However, throttling shouldn't be an issue in normal routine use. The dv7-6b02eg's sound quality is above average, but not in the least reference-worthy. Despite four speakers and a subwoofer, the sound didn't knock our socks off. 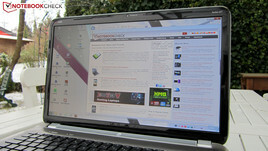 The multimedia laptop gains volume and power with enabled Beats Audio (see screenshot), but tends to fray at the same time. We generally find the sound a bit tinny and imprecise. Bass is audible, but a bit vague. Most contenders would nevertheless lose in a direct comparison. 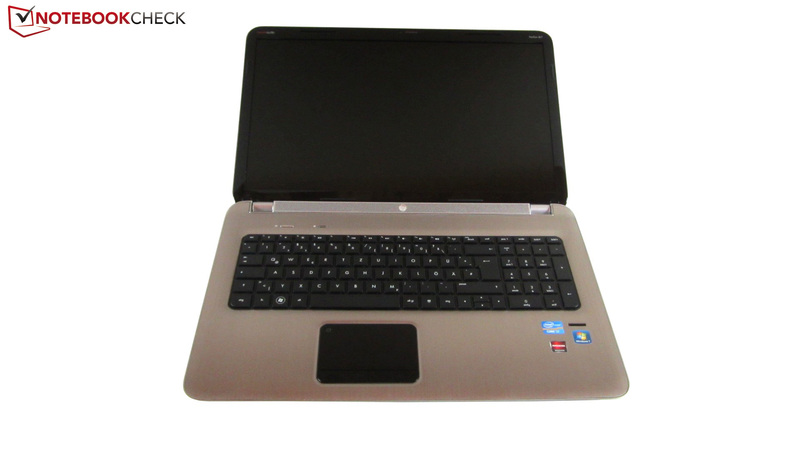 In particular the high maximum volume lets the 17 inch notebook stand out from other devices. 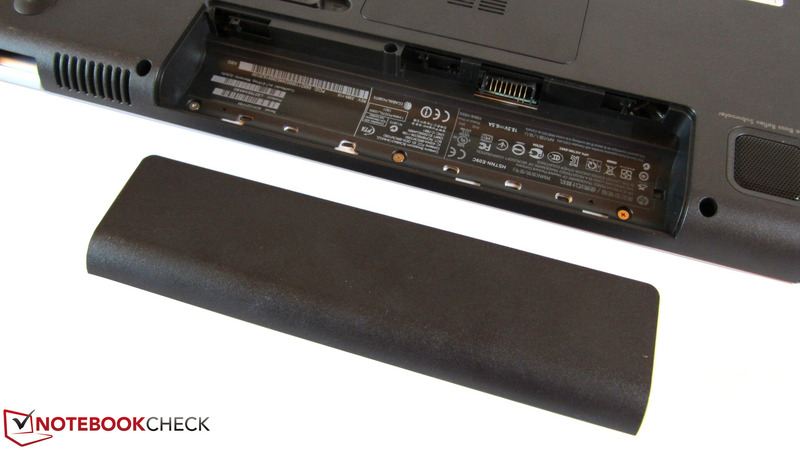 A better sound is found in the Asus N75SF and in the Dell XPS 17, for example. High performance components and moderate power consumption can't be fused? They can when the laptop - as in this case - is equipped with graphics switching. 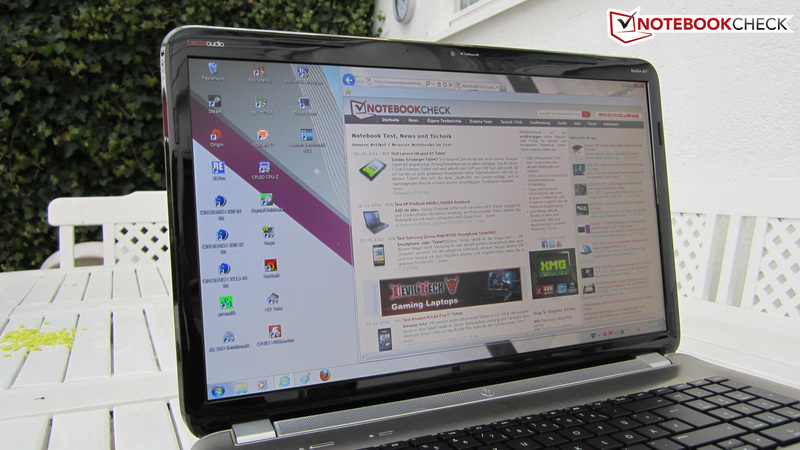 14-22 watts in idle (HD Graphics 3000) are absolutely acceptable for a multimedia notebook. A maximum of 84 watts during load (Radeon HD 6770M) is also acceptable. The Pavilion dv7-6101eg consumed a bit less power not least due to the energy-efficient dual core CPU and the screen's lower brightness in the test. The battery life is still impressive in idle. 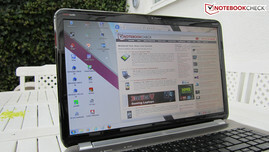 We determined good 5.5 hours with minimum brightness and disabled AMD graphics card in the BatteryEater Reader's test. It's also possible to surf on the Internet for quite a while. The dv7-6b02eg managed almost four hours with a screen brightness of 150 cd/m2 (diverse mix of videos and normal websites). A runtime of about 2.5 hours can be reckoned with when the brightness is set to maximum and a DVD movie is played. In return, one hour is possible during higher load and enabled Radeon graphics card. 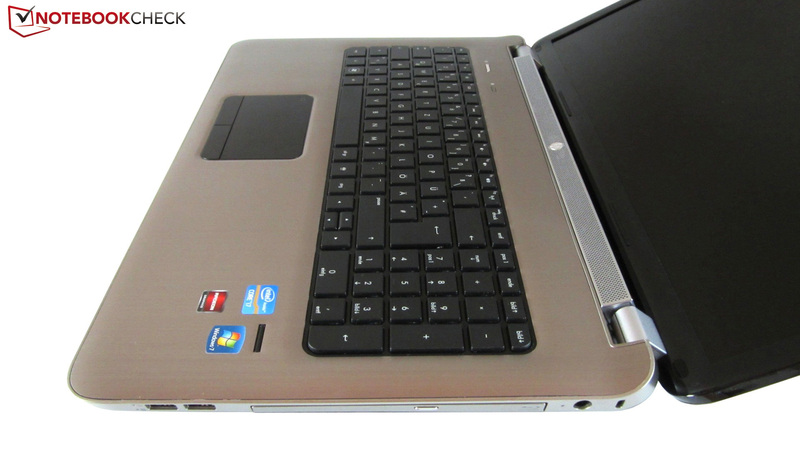 HP sends an elegant, well-equipped and, to the largest extent, well-designed multimedia notebook into the race with the Pavilion dv7-6b02eg. €1300 looks like quite a lot at first glance, but there's a lot of hardware under the hood. Eight GB of DDR RAM, a fast quad core processor with up to 3.1 GHz and a BluRay burner equip the user adequately for the future. The built-in solid state drive is another selling point: Windows responds extremely fast and booting is agreeably short. Although AMD's Radeon HD 6770M frequently has problems with the Full HD resolution, the graphics card is well in line with the other components. All media can be enjoyed due to the high-end screen. The device can be used outdoors marvelously thanks to its screen's matt surface and the great luminosity. Talking about matt: The silver case scores with good workmanship and fairly low smudge sensitivity. 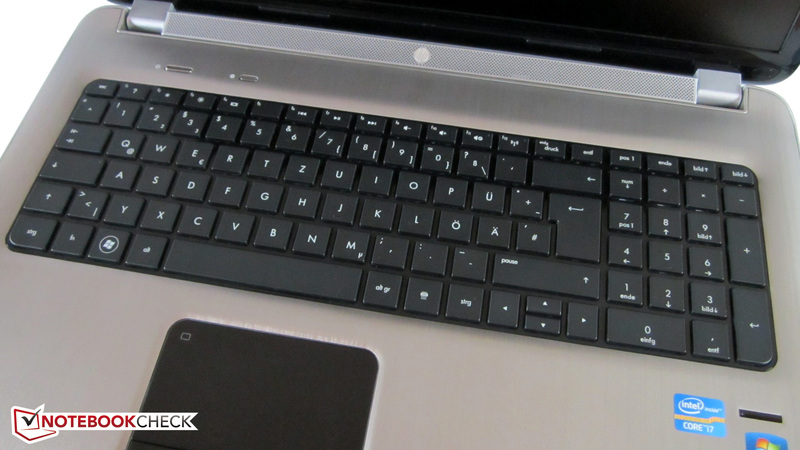 HP could make improvements in connectivity (no eSATA, FireWire or ExpressCard) and noise development. 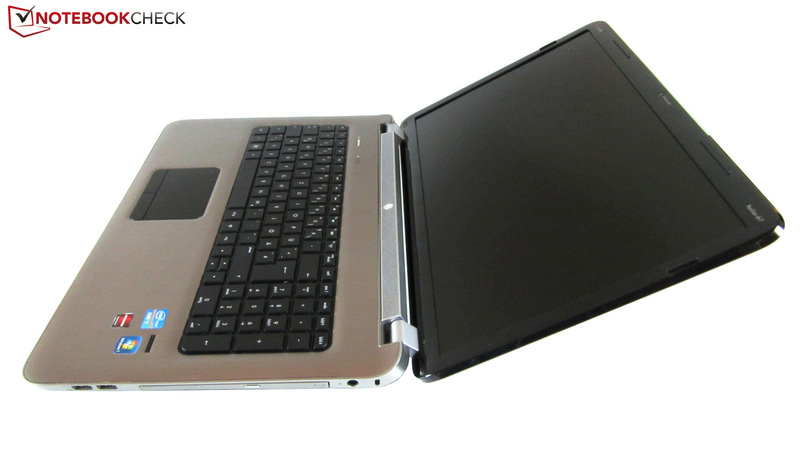 Like many other devices, the notebook is very perceptible during load. A few more fan speed levels wouldn't have hurt. Some buyers will likely also be annoyed by the somewhat spongy keys. However, HP hardly slips up anywhere on total. 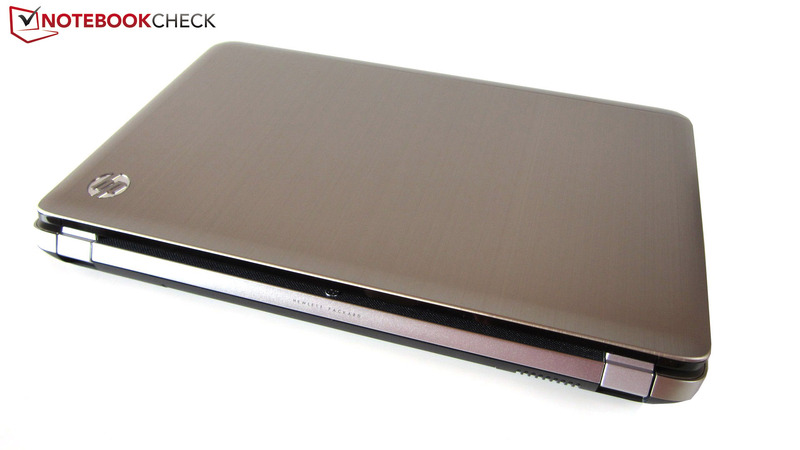 The Pavilion dv7-6b02eg belongs to the multimedia elite right beside the MacBook Pro 17, Dell XPS 17 and Asus N75SF. 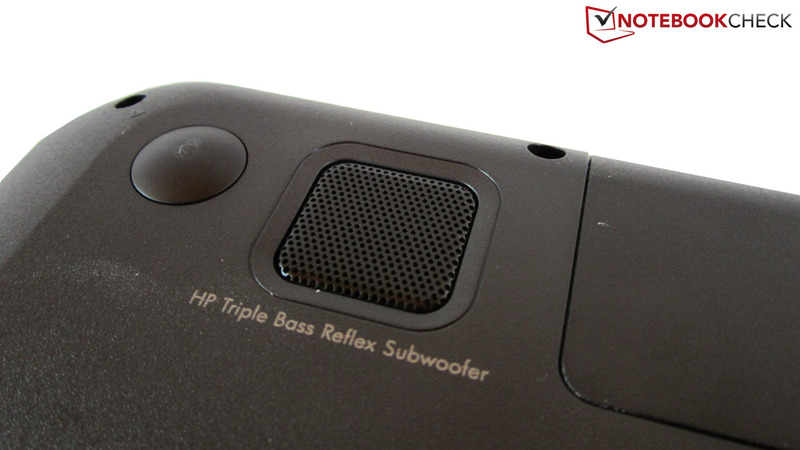 The latter device should be considered if value is put on good speaker sound. 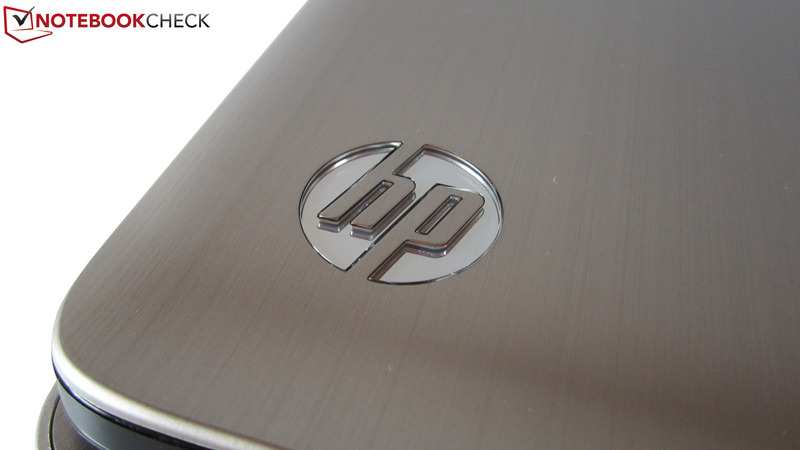 HP mainly uses silver-gray surfaces. In our opinion, the HDD/SSD combination is a great idea. As usual, the battery is on the rear. The battery life is good when the AMD graphics card is disabled. Of course, a webcam is installed. Two speakers are concealed by a grid. 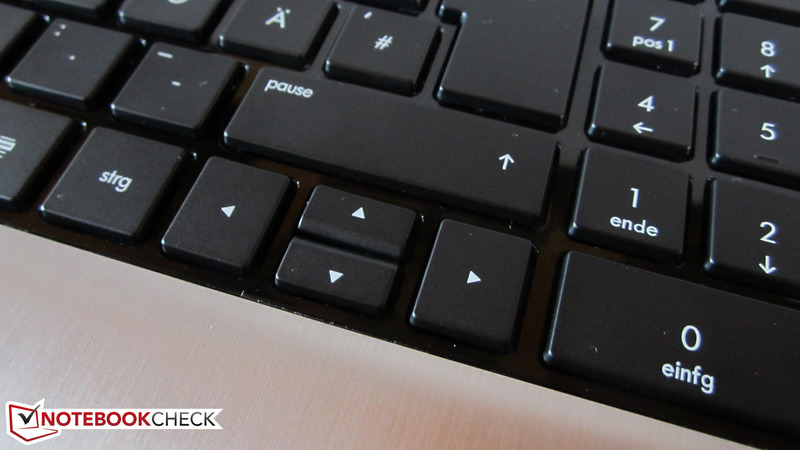 The center arrow keys could be bigger. The keyboard yields evidently in the right area. Not every device has a fingerprint reader. 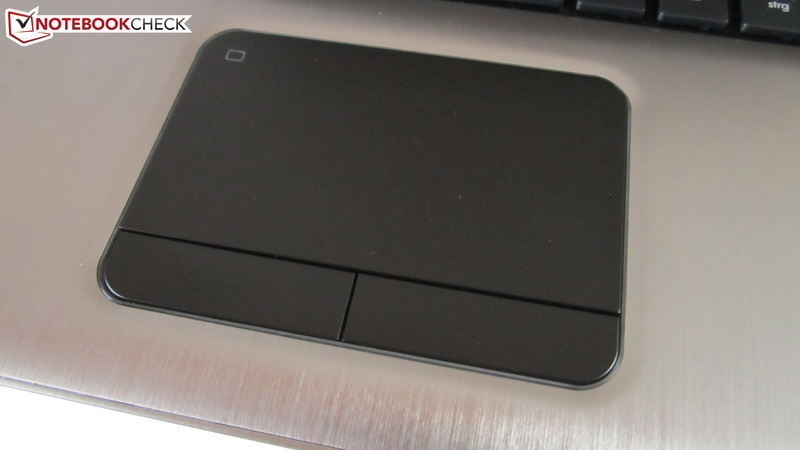 The touchpad supports several gestures. The Pavilion dv7 makes an elegant impression. The workmanship is good for the most part. A card reader is a must have nowadays. Sound can be configured in detail via software. 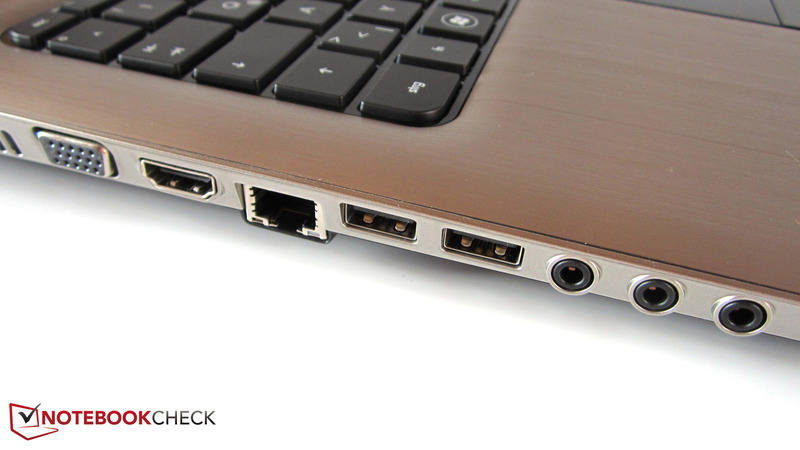 The 17 inch device can boast with two fast USB 3.0 ports. 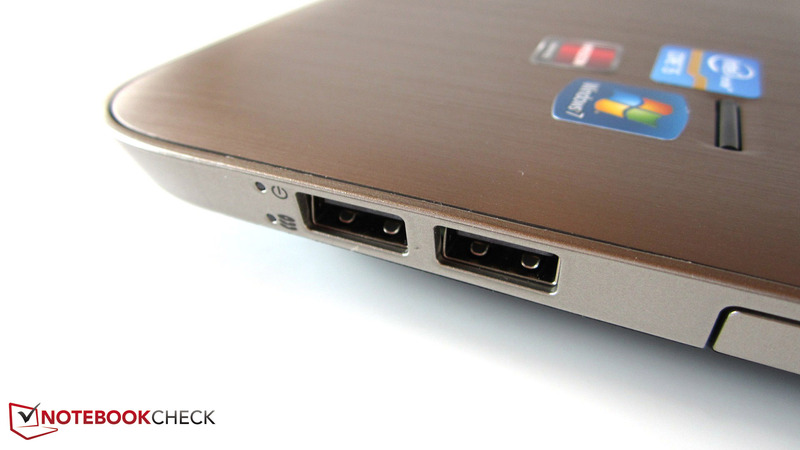 Four USB ports should satisfy most users. The power consumption is kept within limits thanks to graphics switching. A maximum of eight GB DDR3 RAM can be installed. The sound isn't overwhelming despite the subwoofer. Several black elements pep up the appearance. Smudging is hardly an issue due to the matt finish. Handy: The maintenance cover is opened via slider. 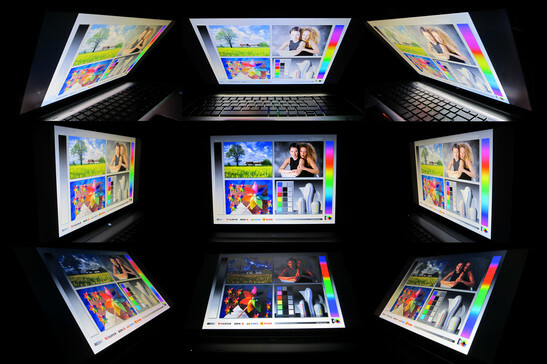 The non-glare Full HD screen has a high luminosity. The 17 inch device isn't exactly light with about 3.2 kg. The lid can be opened to about 150°. 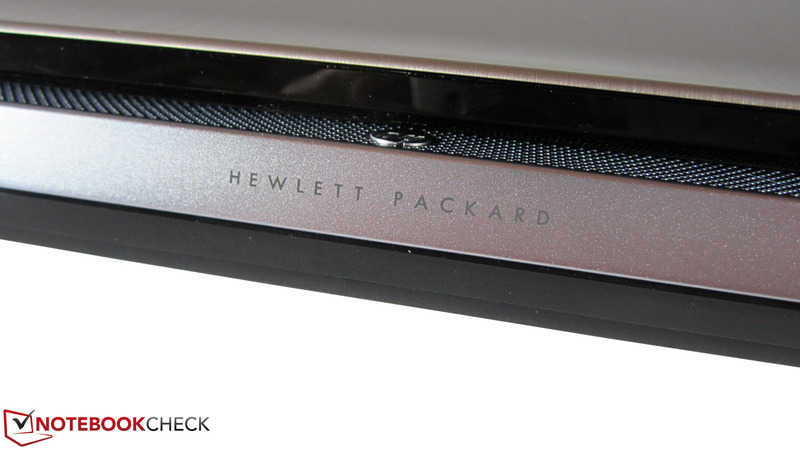 HP once again shows its design skills. The notebook has a height of approximately 4 cm. The graphics card and processor can't be accessed directly. 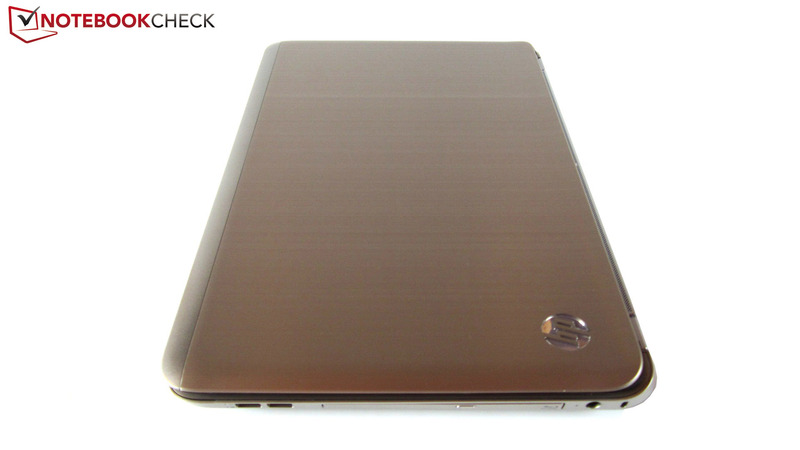 The design partly resembles the Dell XPS 17. The notebook's stability is acceptable. Most ports are on the left. The right has a BluRay burner. Two of the four speakers are located at the front. 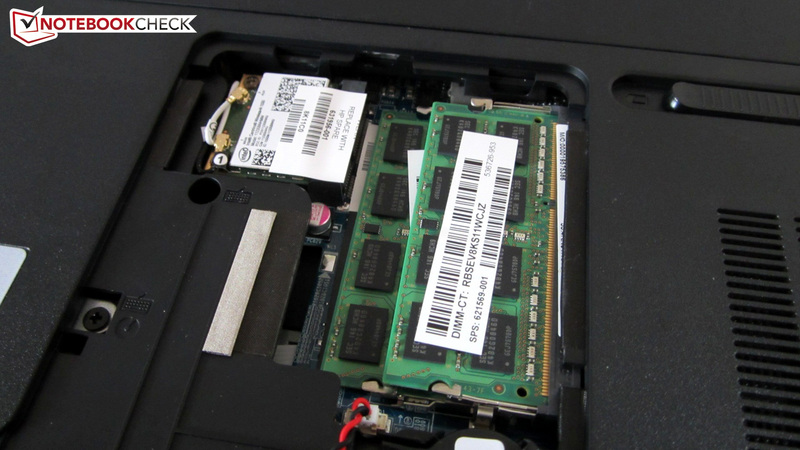 Hard disks and RAM modules can be exchanged when necessary. We would call the power adapter medium-sized. The solid state drive speeds up Windows routine significantly. It would be nice if the fan would stay more in the background during load. The non-glare Full HD screen even meets high requirements. 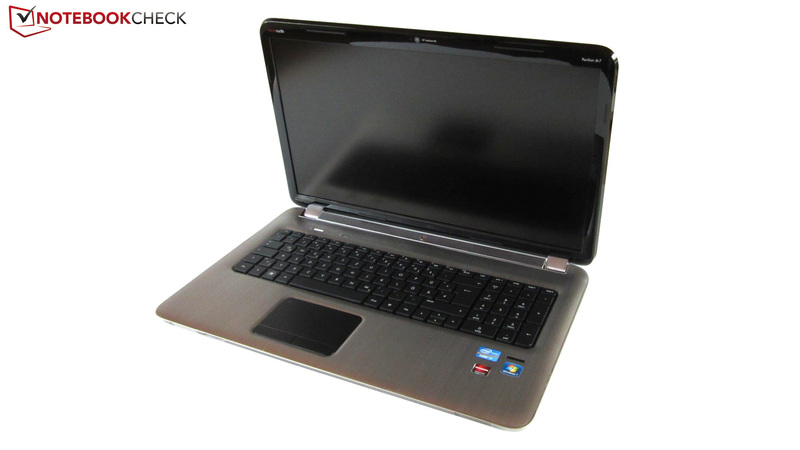 17 inch multimedia notebooks with a good graphics card, such as the Asus N75SF or the Dell XPS 17.